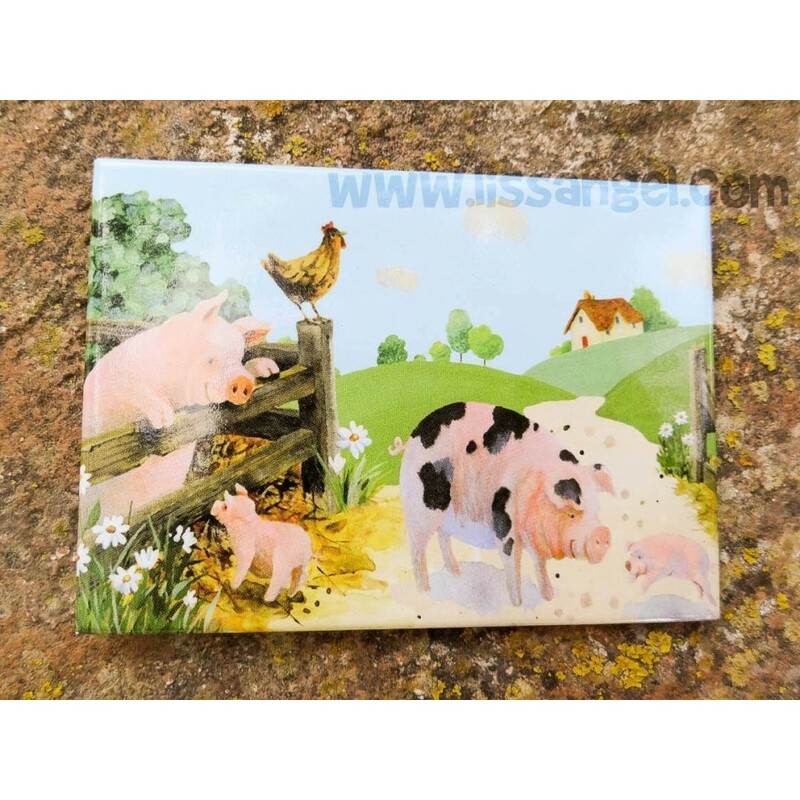 Magnet with farm decoration, where we can see a few pigs with his babies in a beautiful countryside while accompanying a chicken. Decorate your fridge with country atmosphere! The magnet has measures 9 cm x 6.5 cm wide high. With our magnets you can decorate your refrigerator or any metal part and give an atmosphere of peace and tranquility with these beautiful pictures of animals. Add a touch of color to your boring fridge or any metal surface with these funny vintage style animals magnets. Three models to choose from (cat, dog and duck). The decoration with flowers is very nice and colorful. With these flower-shaped magnets with a ladybug perched on them, you can decorate your home in a charming way. In these original magnets with decorative animals, we can see a curious combination of vintage household objects, vegetable style and adorned by some funny bugs. This magnet shows a design of several cows grazing on a farm, while a farmer carries hay with a tractor. Decorate your refrigerator or any metallic element with these striking colors magnets shaped like lizards. What color do you like more? In this magnet we can see two beautiful cats in a garden, while several butterflies flutter around and a snail walks around. Do you like them all? Well, take them! Adding this pack, you will get the three models of magnets shaped like lizards. Save money with this pack. Have you ever seen lovely magnets like these? These animal magnets are so beautiful... Will be perfect wherever you decide to put them. There are four models to choose from: Dog, cat, lion and elephant.